A nice thing about making your own pillow case (and really everything else) is that you get to have it exactly as you want it. You get the fabric you want, and not just one of the 10 shades you're offered at the store, and because it's custom fit, you can have make it an overlap pillow case and have a much more tailored look to your bed. 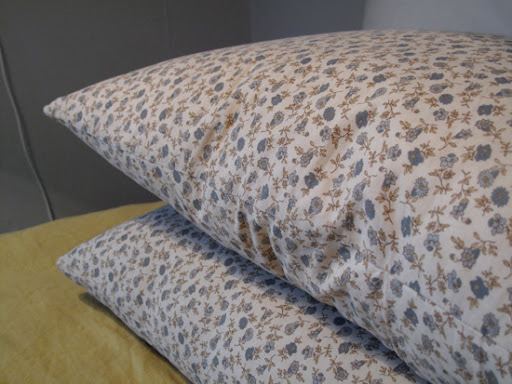 These small floral (I'm obsessed just like everyone else) pillows are the one's I rest my tired head on at night, but because they don't have the open end cases I feel you can put them out front. No one has thus far seemed alarmed. It's also an easy project and adaptable to any square or rectangular pillow, therefore, I've left most of the measurements up to you. 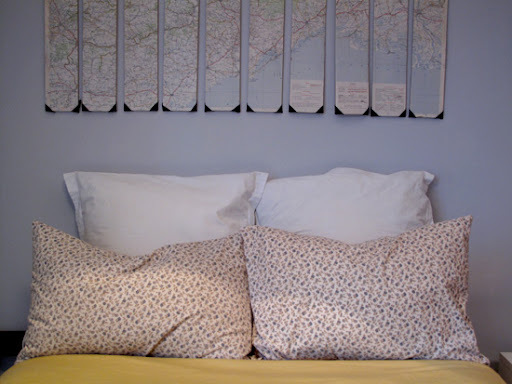 Use a flexible measuring tape to measure from one seam to it's opposite of your undressed pillow form. Do not pull it taught or apply pressure to flatten out the tape, you want to account for the roundness of the pillow. So let it gently lay over the arch and then take your measurements. If you'd like to give your pillow some floating room, add another inch to each measurement. Cut your fabric for the front of the case. This piece should be the length and width of the pillow plus a quarter inch seam allowance. 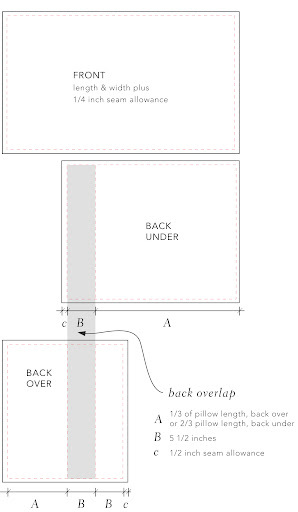 For the back-under piece, cut your fabric the width of your pillow plus a quarter inch seam allowance and the length will be 2/3 the length of the entire pillow plus 3 1/4 inches [for a 2 1/2 inch band (B) with 1/2 inch seam allowance (c) and a quarter inch seam allowance on the opposite end]. For the back-over piece, cut your fabric the width of your pillow plus a quarter inch seam allowance and the length will be 1/3 the length of the entire pillow plus 5 3/4 inches [for a 2 1/2 inch inch overlap allowance (B), 2 1/2 inch band (B) with 1/2 inch seam allowance (c) and a quarter inch seam allowance on the opposite end]. On each back piece fold one short side in for a 1/2 inch seam allowance and press. Next, fold this edge in 2 1/2 inches and press. Top stitch along the outside edge and the inside fold (with your 1/2 inch seam allowance) as show in this diagram above. Place the front piece face up, next place the back-over piece on top of the front: right sides together and aligned with the left of the front. Then place the back-under piece on top of this: right side together with front piece and aligned to the front's right side. Pin all the fabric in place and stich along the outside edge with a 1/4 inch seam allowance. Here is an awkward section (with a plan reference showing section cut, sorry, four years of architecture school...) diagram of how the pieces are sewn/assembled. If you can, serge the raw edge of your seams. Otherwise, turn right side out, press and insert pillow. Done! This is so simple, yet so perfect. I can't wait to make these--after, of course, I've tackled my own quilt. Awesome! Tackle, tackle! I've still got another quilt waiting to be tackled! 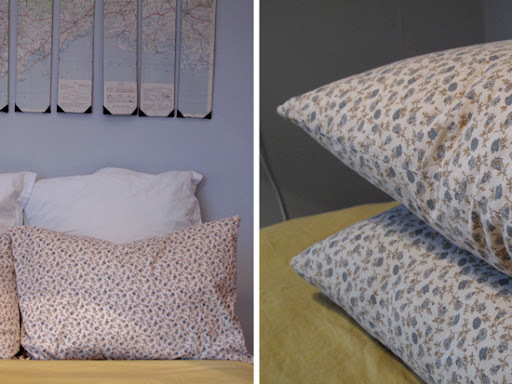 The pillow cases are also great ways to use up spare fabric - or at least that's what I'm telling myself as I imagine having a little stack of different small floral pillow cases.. I LOVE (love, love) the map in the background! Your mattresses and pillows need to be cleaned regularly to be free from dust mites. We provide monthly subscriptions which along with having discounted rates, is an ideal option for senior citizens and people suffering from sinusitis, asthma or other severe breathing problems.